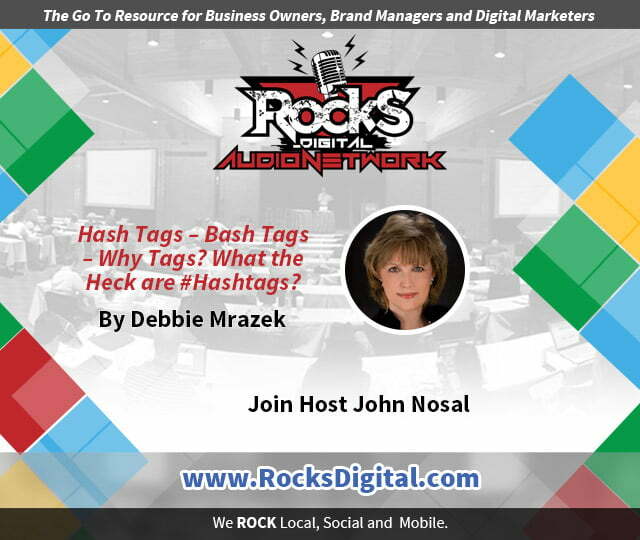 Listen Now on Rocks Digital Audio Network to Debbie Mrazek's content contribution "Hash Tags – Bash Tags – Why Tags? What the heck are #Hashtags?" with host John Nosal. Listen Now on Rocks Digital Audio Network to Bernadette Coleman's content contribution "Dominate Google Local Search: Reviews and Ratings" with host Lissa Duty. Listen Now on Rocks Digital Audio Network to Melanie Neal's content contribution “How To Setup A Social Media Contest” with host Alison Toyne. Listen Now on Rocks Digital Audio Network to Mason Pelt’s contribution "The Guide to Google Tag Manager" with host John Nosal. Listen Now on Rocks Digital Audio Network to Clara Mathews' content contribution "Captivate Your Audience: Use Storytelling in Your Content Marketing" with host Lissa Duty. Listen Now on Rocks Digital Audio Network to Byron Ingraham contribution "Camera Shy? You Can Create Videos Without Appearing In Them" with host Alison Toyne. Listen Now on Rocks Digital Audio Network to Lissa Duty contribution "15 Must Dos to Drive Traffic to Your Blog with Social Media" with host John Nosal. Listen Now on Rocks Digital Audio Network to Laura Armbruster's content contribution "Give Voice to Your Brand: Answer These 5 Questions" with host Alison Toyne. Listen Now on Rocks Digital Audio Network to Bernadette Coleman's content contribution "10 Most Overlooked SEO Mistakes" with host John Nosal. Listen Now on Rocks Digital Audio Network to Patrick Dougher's content contribution "5 Excellent Ways to Use Google Hangouts for Your Business" with host Lissa Duty. Listen Now on Rocks Digital Audio Network to Bernadette Coleman's content contribution "10 SEO Myths Debunked" with host Alison Toyne. Listen Now on Rocks Digital Audio Network to Debbie Mrazek's content contribution "Business Attitude Only Please: Facebook and Facebook Rants" with host Lissa Duty.